The Surge is Fenn’s latest creation. 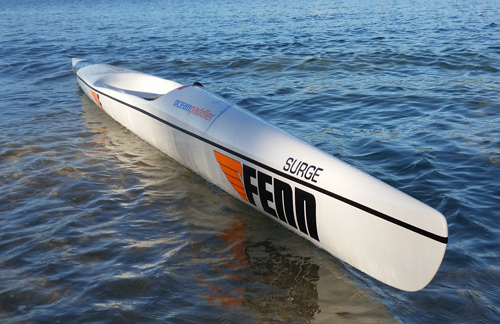 The leaders in surf ski design, Fenn are once again a step ahead. The Surge will be the ultimate flatwater surf ski for bigger paddlers and the perfect allrounder for the middle to smaller paddler. We believe this ski will be more than competitive against K1’s while still performing as good as any ski in the rougher water. When paddling, you notice the sleek lines that give this ski the feel of a fast flatwater ski. Out in the open water, the Surge turns on a dime and has the ability to change direction quickly that all Fenn surf skis are renown for and can pick up the smallest of bumps. *Weights are approximate and may vary slightly. The Hybrid layup uses a special layer of carbon and fibreglass interwoven fabric along with another layer of fiberglass. This layup creates strength while reducing weight enabling a more affordable product. There is very little difference between full carbon and hybrid layups in ​weight making this layup a first class racing product.